All I can say about this card is if you get it trade it or sell it for as much as you can. After all that's what the secret rares are for... right? Actually this funky looking Dragon could be playable if you try to combo him off with all the new cards that allow you to special summon monsters from your discard pile into play. It could be pretty big to Monster Reborn this guy into play and bash your opponent with him. He'll probably get destroyed after you attack with him once but that should be all you need to take out your opponent. Just be careful because if he gets reborned by your opponent it can really hurt. Melkor Blue-Eyes Toon Dragon is perhaps one of the most hyped and sought-after cards, simply because it's a toon and it's a different form to an already "cool" monster. However, is this monster actually any good? It depends. There are so many drawbacks and conditions to toons that playing them is just kamikaze, really. Despite not being able to be attacked by any monsters other than other toons, they're easy to destroy with either magic or destroying Toon World. Really, toons aren't very good at all. That said, I suppose that Blue-Eyes Toon Dragon is the best currently available toon - and he's also subject to what other toons are subject too. I suggest not making a toon deck for competitive dueling, but for a fun (I do mean fun) duel, try it out, for sure. 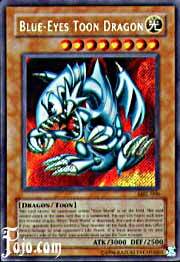 Blue-Eyes Toon Dragon is the best toon, and a supremely cool card, for sure. It's simply not all that great because it's a toon. My rating is 2.7. Toons aren't very good at all. Why shouldn't you use it? of D.? I doubt that though. tribute monster and a toon that makes it hard to bring out, and keep alive. Your lame (FYI: take your opponent's Blue-Eyes Toon Dragon). that you summon it and you have to pay 500 to attack. them out of the game for 1 turn, keeping them safe. jammers, you can take the game in 2-3 turns. your deck if you're playing a toon deck.